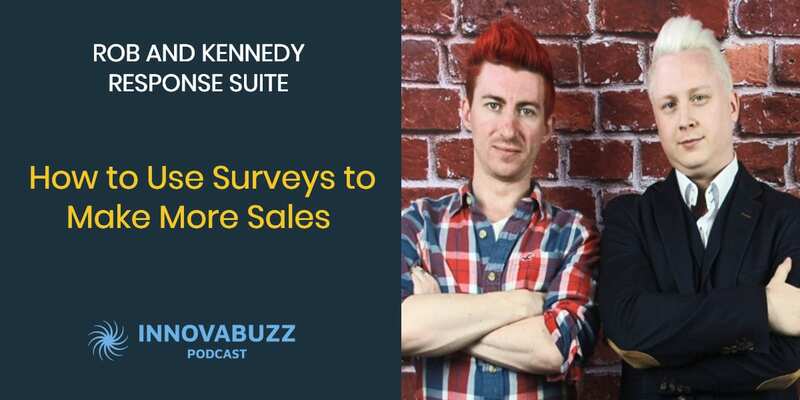 In this episode, I’m really excited to have on the InnovaBuzz podcast as my guests, Rob and Kennedy from Response Suite which uses the intelligence of surveys to get more of your customers buying more of your products, more often. I’m really lucky to have two guests for the price of one today and as you’ll hear, Rob and Kennedy are also entertainers! Rob has a comedy show using his skills in psychology, body language and reading people to read his audience’s mind AND Kennedy entertains with magic and hypnosis. The moment somebody completes a survey is the moment that they are least resistant to a new sales conversation. They are in this moment of engagement. They are genuinely fully engaged because they have given you feedback and that is a great time to give them some kind of a sales message. Depending on what your customers’ responses are on the survey, you can make the perfect offer to what they really need right now and help them out. Popping an offer after a survey sells really well. Every business should send out a survey to find out and collect testimonials that you can use on your product. A survey doesn’t have to be the end of the whole marketing and sales process. It can actually be the pivot point. It is that moment that you can take advantage of to open up a new sales conversation. Surveys allow you to plant a seed of the list of things that you do. List all the things that you can help your customers out with. It will allow your customers to see the ideas that they didn’t even realise they have a problem with. Pushing the information you get from the surveys into your email marketing system or your marketing CRM allows you to create follow-up messages that are specifically helpful for that person. Immediately after one signs up for your webinar, ask that person the chance to take a survey. 100% of engaged people complete surveys. Make sure that your surveys are easy to complete. Let people see how long the survey is. Low completion rate is usually not because of anything that has to do with the survey as a concept but it is usually because people ask too many questions. A really good survey should have 3 to 5 top questions that are multiple choice questions instead of long, insightful, and deep questions and answers. People don’t have time and are honestly not that interested in helping you out. If they are going to help you out, you want to make it as quick as possible. Make it really fast and simple. A sales page should be as long as it needs to be to make the sale but a survey should only be as long as it needs to be to get what you need. Only ask the questions that you actually do something with. Surveys help you plant ideas in your customers’ minds. Use conditional logic to hide and show questions or sections of pages based on your customer’s response. Display only the questions that are useful. You can make your survey longer provided that the questions appear and disappear based on what your customers are saying. If you are going to break your survey down into a couple of pages, have a progress bar that visibly displays how far your customer is through the process. Look at what people are trying to achieve and not what they think they want, then find a way to deliver what they are trying to achieve. Here are Rob and Kennedy’s answers to the questions of our Innovation round. Listen to the interview to get the full scoop. ﻿#1 thing to be more innovative – Be completely intolerant to average. Best thing for new ideas – Listen to your customers in terms of what they think they want. Take all the feedback you get from them then put that all together to deliver what they need in a wrapping that says it is what they want. Keep project / client on track – Using Asana and working through a set of milestones at every stage of the journey. Being agile and knowing that things are going to change as you go. Differentiate – Embrace your story. Your story is so different and is made of different elements which are unique when compounded together. There are things within it that have led you to where you are now and by driving everything that you do in your business, in your marketing, and in your personal brand through it, it allows you to stand out. Be disruptive. It’s all about saying “Right now, I don’t how to do this but wouldn’t be good if I could”, and then finding other people to brainstorm and flow the idea around. You can reach out and thank Rob and Kennedy through their website. Grab your 14-days FREE TRIAL of Response Suite here and get FREE access to the Survey Marketing Masterclass Training, and a one-to-one chat with either Rob or Kennedy to help you build your campaigns and start getting results! Rob and Kennedy suggested I interview Clate Mask, the Co-founder and CEO of Infusionsoft. So Clate, keep an eye on your inbox for an invitation from us to the InnovaBuzz podcast, courtesy of Rob and Kennedy. They sport hairstyles that look like comic-book characters. Rob is a hypnotist and Kennedy is a mind-reader. They each have their own successful business aside from Response Suite. Rob founded Success Kickstart and Kennedy founded CXY Limited.